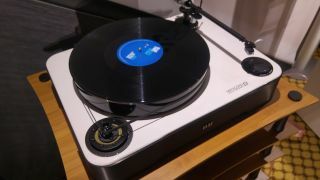 The best new turntables from the Bristol Show 2017 | What Hi-Fi? The 2017 Bristol Show is well under way, with some of the best products in the worlds of hi-fi and home cinema on display. Once again, the turntable count has been exceptionally high with a number of new decks making an appearance. Take a look at some of the turntables that caught our eye. We kick things off with the Elipson Omega 100 RIAA Carbon, a carbon-clad version of the standard Omega 100 RIAA BT. Next up is the Planalogue Prelude, closely followed by Pro-Ject's Essential III deck. We round things up with Elac's impressive-looking Miracord 90th Anniversary turntable and it wouldn't be a turntable round-up without the eagerly-anticipated Technics SL-1210GR.